Today I am sharing a recipe of Modak for Nivedya during Ganesh Chaturthi Festival. Coconut Dry fruit Modak made from Coconut & dry Fruits with Condensed Milk. 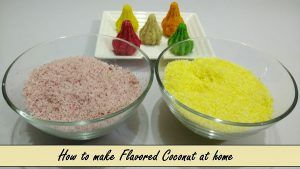 You can also use flavoured desiccated Coconut to make it more colourful. Coarsely Grind Dry fruits (Almond, Cashew & Pistachio) in the mixer with Nutmeg Powder, Cardamom Powder & Saffron. Divide desiccated coconut into 2 parts in separate bowls. Add ½ cup Condensed Milk in each bowl and mix well. Add a small portion of the mixture and add in Modak mould. Using your fingers spread the mixture on the walls of the mould. Fill the mould and level the mixture with your fingers, carefully open the mould. Repeat the process to prepare Modaks from rest of the dough. 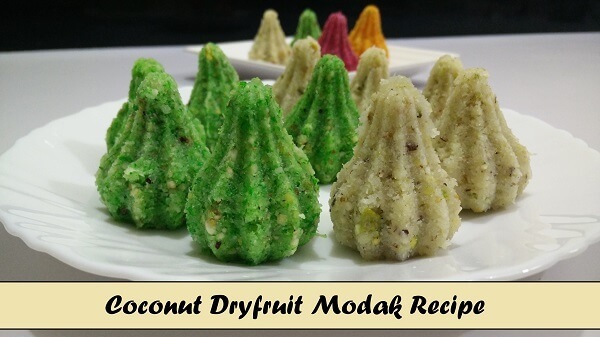 Keep Coconut Dry Fruit Modak in the refrigerator and consume within 1 week.